During an event on Saturday celebrating the 105th anniversary of Ronald Reagan’s birth, the United States Mint unveiled designs for the gold coin commemorating Nancy Reagan. 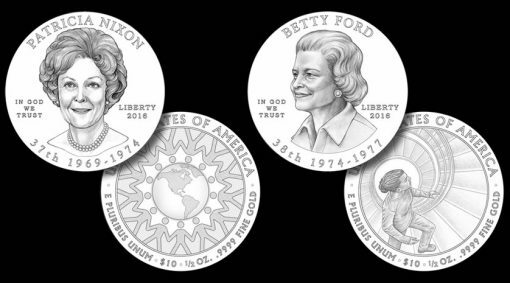 On Monday, the agency announced designs for the other 2016 spousal coins honoring Patricia Nixon and Betty Ford. Candidate designs for the two former first ladies were revealed last year. The Treasury Secretary was responsible for the selecting the final artwork. Introduced in 2007, the First Spouse Gold Coins in the series are produced at the U.S. Mint facility in West Point, are struck in one-half ounce of .9999 fine gold, are minted in collector qualities of proof and uncirculated, and feature portraits of the first spouses on their obverses along with reverse designs emblematic of their life and work. Richard Masters designed and Don Everhart sculpted the obverse or heads side of the Patricia Nixon First Spouse Gold Coin. Its reverse, also designed by Richard Masters but sculpted by Jim Licaretz, features stylized figures standing hand-in-hand surrounding a globe, symbolizing Mrs. Nixon’s commitment to volunteerism around the world. Barbara Fox designed and Michael Gaudioso sculpted the obverse of the Betty Ford First Spouse Gold Coin. 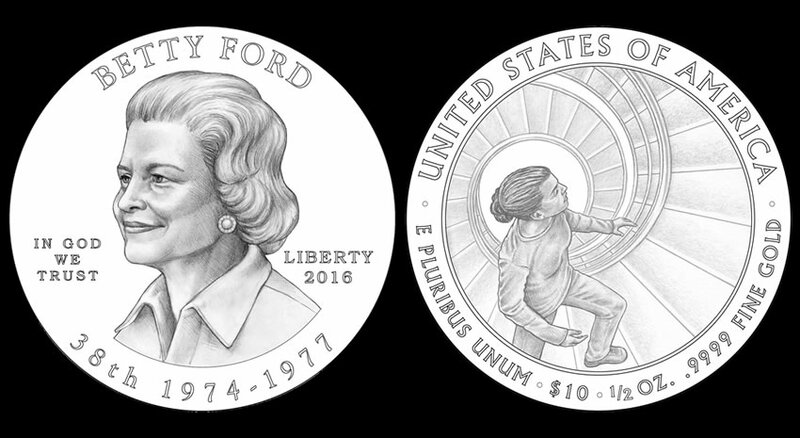 Its reverse features a young woman ascending a staircase, representing Mrs. Ford’s openness and advocacy regarding addiction, breast cancer awareness, and the rights of women. Chris Costello designed the scene and Renata Gordon sculpted it. The obverse of each coin is inscribed with the first spouse’s name, her order and years of service as first spouse, the year of minting or issuance, IN GOD WE TRUST, and LIBERTY. Each coin’s reverse includes inscriptions of UNITED STATES OF AMERICA, E PLURIBUS UNUM, $10, 1/2 OZ., and .9999 FINE GOLD. 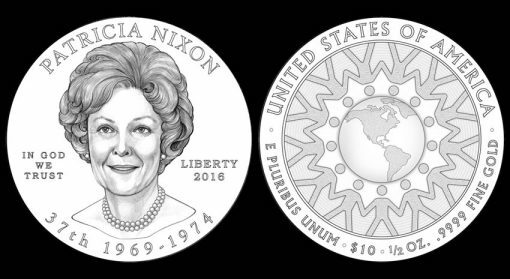 First Spouse Gold Coins honoring Patricia Nixon launch on Feb. 18 while those commemorating Betty Ford are set to go on sale Mar. 25. The final coins in the 24-karat gold coin program, celebrating Nancy Reagan, have a scheduled launch month of July. Always liked Betty, she was honest and up front. A professional dancer, she gave in to the urge to dance on the Cabinet Room table before leaving the White House. Online there’s a nice picture of her doing it.